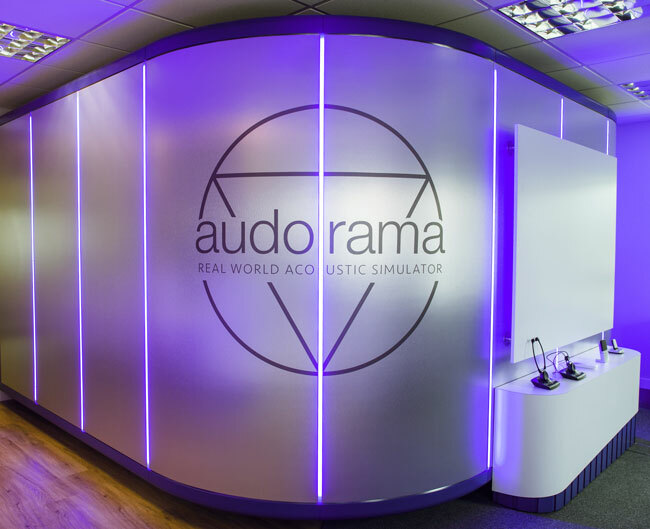 The Audorama® is a totally immersive virtual sound experience developed by Audify® that enables us to replicate any real world acoustic environment in 3D. It uses more than 20 high fidelity speakers to create a sphere of sound from every direction – including above and below – across the entire spectrum of the human hearing range. Whoever is sitting in The Chair close their eyes and pick out where a sound is coming from, estimate how far away it is, and track its movement towards them or away from them, or around them. The Audorama® is sophisticated enough to be able to recreate the sensation of space and room size too, so you would be able to tell whether you were in a large open space (e.g. outdoors), or a small room, or a large building like Exeter Cathedral. This is because the Audorama® recreates the echoes and the reverberations from every direction that our brains use to create our awareness of size and space. There are two ways we bring the ‘real world’ into the Audorama™. The first is with field recordings, using a special 3D dimensional recording technique that captures and preserves sound in a such way that all the spatial and directional information can be faithfully recreated in the Audorama®. The second is via very advanced computer simulation using a lot of clever mathematics. This enables us to put any sound we choose – and any number of sounds – anywhere within the 3D world created by the Audorama™. This means the possibilities of what we can do with the Audorama™ are infinite. 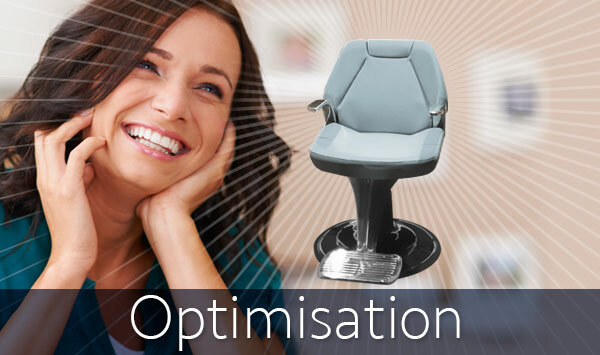 We can tailor each and every experience to whoever is in The Chair at the time. What is the purpose of the Audorama™? We designed and built the Audorama® to create a realistic 3D acoustic environment that was as true-to-life as is realistically possible, but one that we could accurately adjust and control. 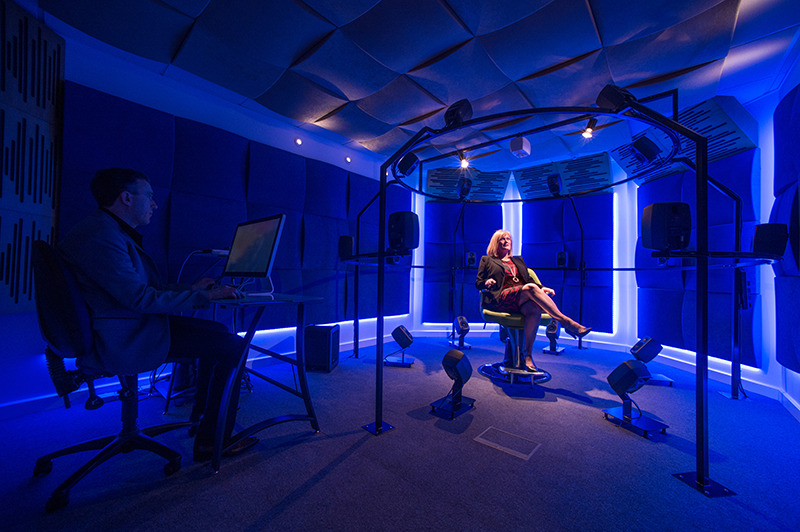 There are two main purposes of this: firstly, so that when we are looking at what someone’s hearing can and cannot do, we are basing it on ‘real world’ performance rather than the artificial “beeps and tones” of the traditional hearing test. In real life we rarely hear beeps, unless the smoke alarms gone off when we're cooking bacon! Instead we hear conversation, usually when other things are going on such as background noise or distractions, or other people speaking at the same time. We hear environmental sounds that alert us to danger, like the footsteps behind us or the whizz of the fast approaching bicycle as we step out into the road. We hear the sounds of nature, like the birds singing and the waves lapping the shore. We hear music and the sound of children's laughter. This is the rich tapestry of real world sound. Ask the majority of people how well they hear, and most people will find that one-to-one is often pretty good – except for certain types of voices, perhaps. But we all reach a point where the hubbub of 21st Century noise will make it more of a challenge to follow conversation or tune out distracting noises – that level may be different for each of us, but simply put: if there’s too much other stuff going on it will interfere with what we’re trying to focus on. So often people will say to us that their difficulty is the situation, not their hearing: it’s when there’s too many people speaking all at once; it’s in restaurants with background noise and wooden floors, it’s when people are speaking too quickly or dropping their consonants. The Audorama® enables us to bring all of this into our assessments. We can find out how many people have to be talking all at once before someone finds it a challenge. We can see whether the difficulty that someone has in background noise is to be expected – and more importantly, does it have to be endured or can it be improved technologically or with some specific listening strategy we can teach? Few people realise that in background noise and groups we actually use a combination of techniques, skills and strategies to follow conversation – not just hearing. We use our memory capacity, our attention skills (ability to concentrate on one thing and tune out the distractions), and our ability to work out where a sound is coming from. We combine all these skills to “lock on” to sound sources coming from just the person we are listening to — and the brain does all this extra stuff that we’re not even consciously aware of, such as automatically joining up sounds that belong with one another based on their timing and their tone. And, of course, we combine it with visual information. See also: the Hearing Chain. The Audorama® enables us, for the first time within hearing care, to bring all these elements of the Hearing Chain together so we can provide our guests and clients with truly personalised advice and tailored hearing solutions. As well as a really sensational hearing and listening experience! The second main purpose of the Audorama® is to be able to objectively measure and demonstrate any improvements we make. We don't believe in leaps of a faith. 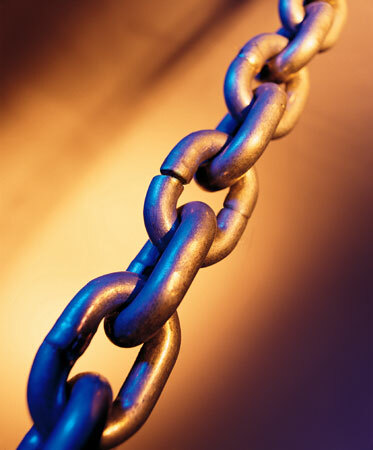 We believe in tangible benefits, which the Audorama™ makes plainly evident. Say we fit some musicians hearing protection or some gunsport ear defenders. 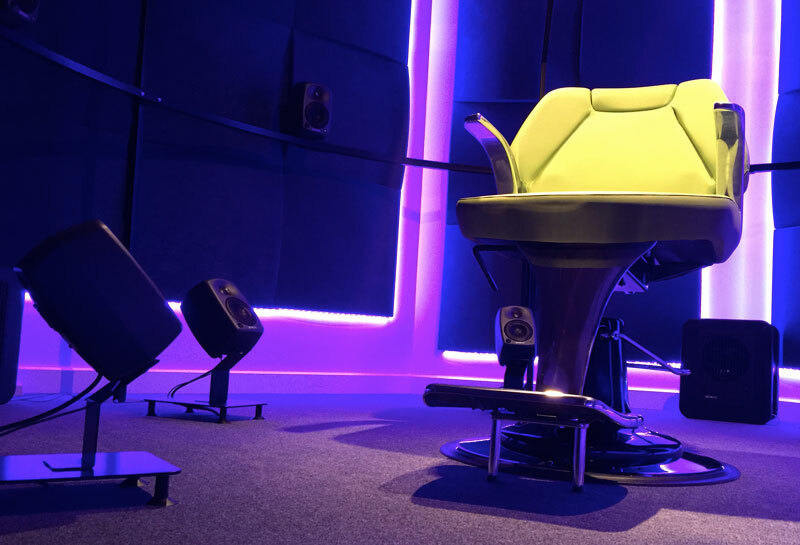 Wouldn’t it be useful to fit them at Audify®|Exeter, then test them in the Audorama®. to make sure they’re working properly whilst someone is wearing them, before they take them away into the real world? Imagine being able to replicate the sound of sitting on a motorbike then putting the motorcycle plugs in and noticing the drop? The Audorama® can bring relief to those with tinnitus, creating a virtual enviornment of the sounds of nature known to reduce stress, anxiety and lower tinnitus levels. Guests can spend time relaxing to birdsong or listening to the sea lapping the shore. Today’s hearing technology is incredibly advanced. Even the most basic ones incorporate computer chips that enable us to personalise sound. Up to now hearing care providers generally set these up according to calculations based on ‘averages’ across many ears, with a few adjustments for loudness and tone based on comments from whoever’s wearing it. That’s because traditionally it’s been very difficult to measure the ‘real world’ performance of hearing technology whilst someone is wearing them, because you’d have to follow them around whilst they go about their daily life! Even then it would be tricky, because sound in the world is constantly changing, so you never encounter the same thing twice... so how would you know if the improvement or the difficulty was because the situation was easier or more difficult – or because the technology was doing it’s job effectively? This was one of the main challenges we wanted to solve, which led to over a year of researching, designing and building the Audorama®. Because now we could set up repeatable real world environments and measure how much better our clients and guests perform because of the technology compared to no technology, or older technology, or alternative technology. It means that we can now compare different products and see which one is best. Because of the Audorama® we can now personalise and optimise the sound settings within the hearing system and try out alternatives. Whoever’s in The Chair can actually demonstrate (rather than having to rely on feeling) that they’re following conversation in background noise better because of one particular adjustment versus another. That simply wouldn't be possible without the Audorama®, which makes Audify®|Exeter quite possibly the most advanced hearing care centre in the world. 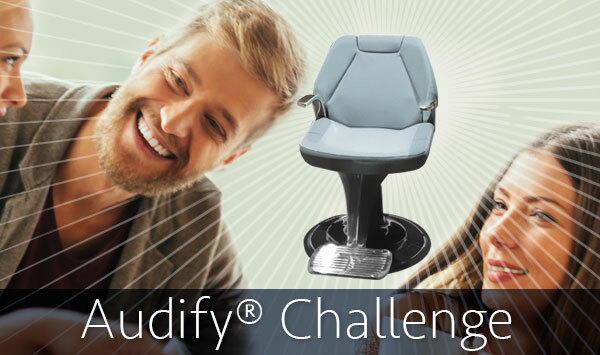 Take the Audify® Challenge – the revolutionary hearing experience designed to understand how you hear in real world situations. 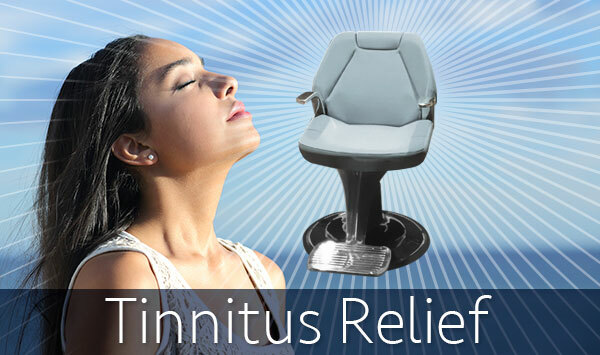 Get relief from tinnitus or stress by spending time relaxing to the immersive 3D sounds of nature in the Audorama™. Get more from your hearing technology. 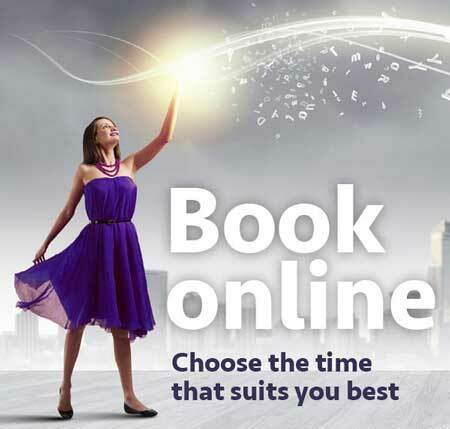 Have it personalised and optimised for the real world, with a session in our Audorama™.